Singapore (VNA) – Minister of Planning and Investment Nguyen Chi Dung and Singapore’s Minister of Industry and Trade Lim Hng Kiang co-chaired the 12th ​Vietnam-Singapore Economic Connectivity Ministerial Meeting that took place in Singapore on September 23. At the meeting, the two sides reviewed bilateral cooperation in six areas since the 11 th meeting in the central province of Thua-Thien Hue in April 2015. They expressed delight at the strong growth of bilateral ties recently, especially in investment, trade and education and training. Singapore is currently the third largest investor of Vietnam with over 1,600 projects totalling 38 billion USD. In 2015, two-way trade reached 21 billion SGD (16 billion USD). Seven Vietnam-Singapore Industrial Parks (VSIPs) in Vietnam have attracted 9 billion USD in investment and creating 170,000 jobs. The two countries have enjoyed sound partnership in education and training, with various student exchange programmes and training courses for management officials. They have also boosted tourism affiliation on the foundation of a memorandum of understanding signed between their Tourism Administrations at the previous meeting. Addressing the event, Lim Hng Kiang stressed that the meeting is an effective mechanism in the framework of the bilateral partnership, which has a great influence on trade and investment ties between the two economies. Noting great potential for the two countries to expand their economic cooperation potential, he said he hopes that both sides will work more closely together to fully tap the potential in order to deepen their strategic partnership. On his part, Minister Dung affirmed Vietnam’s interest in fostering ties with Singapore . 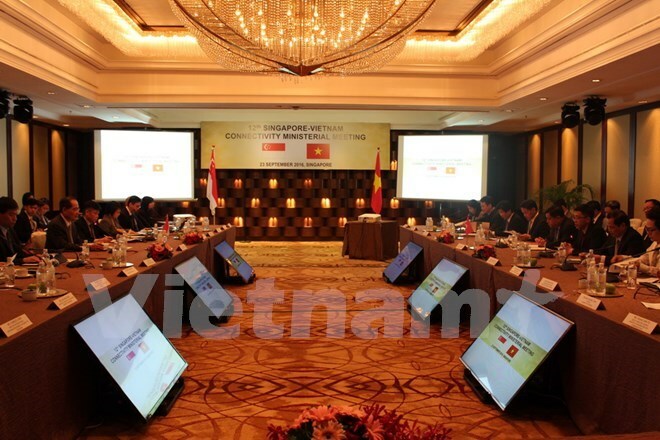 He asked for the Singaporean side’s coordination in designing and implementing initiatives within the framework of an agreement on connecting and encouraging Singaporean firms to invest in Vietnam in new cooperation areas to elevate their win-win affiliation. During the meeting, the two sides also proposed measures to increase two-way trade and call for Singaporean investment in Vietnam’s agriculture, aquatic farming and transportation. Vietnam suggested that Singapore continue supporting education projects and increase scholarships for Vietnamese students, as well as boost cooperation in cyber security and startup. Vietnam asked for Singapore’s stronger engagement in State-owned enterprises’ restructuring through buying shares of large companies, while giving the country technical support in enhancing capacity and building mechanisms for its finance-banking and stock markets. Singapore should expand investment in the public-private partnership form in such fields as infrastructure, maritime transportation and energy, Dung said. The Vietnam-Singapore economic connectivity agreement was signed by the two governments in 2005, focusing on six areas of finance, education and training, traffic and transportation, information technology and communications, investment, trade and services.